What is the best way to capture and use rainwater that lands on our hard surfaces? Above photo by: Tom Grundy. Licensed under Creative Commons. Cost: rainwater harvesting saves money on water bills. Once the system is installed the water supplied is almost free (apart from slightly increased energy bills to run the pumps) so rainwater harvesting should save money. Carbon: rainwater harvesting has a lower environmental footprint than mains water. Mains water is pumped long distances and heavily treated to make it potable. Water for flushing toilets, irrigation and washing machines does not need to be potable so using rainwater direct from a building’s roof should have a lower carbon footprint. Flooding: storing and using rainwater should help alleviate flooding by reducing surface water runoff. Water stress: using rainwater reduces the demand on the mains supply system and could help alleviate water stress in the local area. However, the message from UK planning documentation is mixed. If you were to assess a new building under BREEAM you would find it difficult to get full points under the issue “reducing consumption of potable water” without using an alternative supply to meet some of the demand. The London Plan places “storing rainwater for later use” at the top of the hierarchy for sustainable drainage options, but when it comes to water supply, only advocates rainwater harvesting when it is “energy and cost effective”. So, are rainwater harvesting systems cost and carbon effective and do they really help to alleviate flooding and water stress? Rainwater harvesting systems can be expensive to install. A large proportion of the cost is in the underground storage tank. The bigger it is the more expensive. Equally, the bigger the tank, the more water is collected and money saved from water bills. However, mains water is quite cheap at roughly £1.2/m3 for the average consumer. On most systems we have looked at, the savings on water bills do not pay back the initial capital cost within the lifetime of the system. Even if the cost of mains water were to increase by 8% year on year, as in the worst-case prediction by OFWAT, the whole life cost of most systems would still be higher than using mains water. 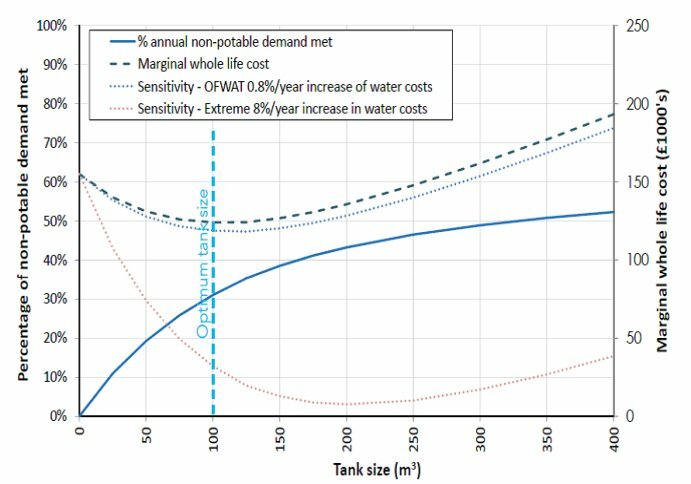 Marginal whole life cost of rainwater harvesting for different tank sizes. (Large office block, buried tank and harvesting water to flush toilets, based on climatic timeseries of 35 years). Both mains suppliers and rainwater harvesting systems need to use pumps to move water around. The average total carbon footprint of UK mains water supply is 0.34kgCO2e/m3 (DEFRA Green House Gas Repository). In order to compare the operational energy used in rainwater harvesting systems, the Environment Agency collected information on the energy required to run the pumps used in various rainwater harvesting systems (Figure 2). At the current carbon intensity of the grid (0.48 kgCO2e/kWh from the DEFRA Green House Gas Repository), only one of the rainwater harvesting systems (Nash 2009/10) surveyed would supply rainwater at a lower carbon intensity (0.29kgCO2/m3) than mains water. Additionally the Environment Agency calculated the embodied carbon of a storage tank to be between 184 and 307kgCO2 for an individual home. Even using the most efficient pumping systems (as described by Nash 2009/2010) to supply a typical 3-bedroom house it would take about 60 years before the embodied carbon of the tank is offset by the savings. If you take into account the embodied carbon of the additional pipework, pumps, replacements and maintenance it would take much longer or may never pay back! Dealing with surface water runoff at source is becoming increasingly important as the UK begins to suffer from more severe flooding and rainwater harvesting is often advocated as part of the solution. In design, rainwater harvesting is not taken into account when sizing stormwater attenuation tanks and ponds. Drainage engineers assume that the rainwater harvesting tanks will be full at the start of a heavy rainfall event to ensure they can comply with peak discharge requirement. For this reason, the rainwater harvesting tank will usually be an additional cost and use of resources and will not result in a reduction in required drainage infrastructure. In reality, some of the rainwater harvesting tanks within a catchment area will be empty or partially empty at any one time. At macro level, this will contribute to reducing flood risk. However, the overall contribution is hard to measure and unlikely to be a resource or cost efficient way to control flooding. Water stress is caused by increasing demands and an inadequate capacity to store enough water for long dry spells. In general only very large rainwater harvesting tanks would be able to store enough water during these periods, leaving most properties to rely on mains water supply when the mains water system is at its most stressed. The impact of rainwater harvesting systems on water stress and local hydrology is heavily dependent on context. For example, in London during a heavy rainfall event, a significant proportion of the rainfall volume is discharged directly into the Thames and does not necessarily recharge local natural water resources. In this case harvesting rainwater could help to hold a greater proportion of rain from heavy storms and hence reduce the stress on the local natural water resources. This would be beneficial in a dry period. However, during a small rainfall event, rainwater harvesting could divert water away from the natural water systems and potentially have a detrimental impact on biodiversity. Judging rainwater harvesting systems on their potential to reduce consumption of potable water alone is simplistic. Just as each system should be designed to meet the needs of an individual project, each system should be judged on their whole life cost and environmental performance and this is very context specific. Situations where storage can be provided cheaply and with low embodied carbon such as in a pond rather than an underground tank or where the rainwater requires minimal treatment and pumping before use such as in water butts and irrigation systems will be more favourable than conventional buried tank systems used to flush toilets. As things stand in the UK, improvements in pump performance, pump controls and costs will be needed before rainwater harvesting earns its reputation as being a sustainable solution in any context.